Jackson Machinery’s FlexiMatic® is an extremely versatile intermediate sized accumulator head industrial blow molding machine which features excellent uniformity of parts and extremely fast tooling changeover capability between jobs. 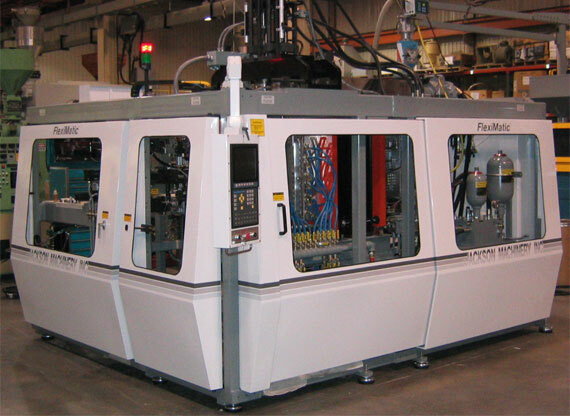 The FlexiMatic® is utilized as the core of our “Automated Work Cell” concept technology which features in-machine trimming and finishing of all manner of difficult to manufacture parts. Combining the finishing steps into the machine saves on post molding labor. The FlexiMatic® is available in numerous clamp, extruder, and accumulator head combinations. Heads are available in both single and dual configurations with sizes available from one half to five pound shot capacity. The FlexiMatic® features Bosch proportional hydraulics for superior repeatability during clamp transfer, for parison pushout and extruder screw speed with the accuracy provided by closed loop systems. The Barber/Coleman MACO Compact control system is a standard feature which provides a user friendly operator interface for easy set-up of all machine functions, plus 100 point parison control. MAC manifold mounted pneumatic systems are standard.